Cody Mahan and his family didn't think they would have to deal with cancer again so soon. Cody Mahan, above, volunteered for a clinical trial that may improve surgical results by making his tumor more visible. Provided by Cody Mahan. In December, he started to experience headaches and then pain in his neck. His family took him to a hospital close to where they lived in Tennessee, suspecting meningitis. Doctors discovered a tumor on the right side of his brain. "It was quite a shock," says Cody's mother, Lisa. "It was the furthest thing from our minds when we went to the ER." They had thought cancer was behind them. As a teenager, Mahan had ALL (acute lymphoblastic leukemia) and had received full cranial radiation as part of his treatment. At the time, this was a standard prophylactic for patients with ALL. The radiation, his family suspects, may have led to the development of the brain tumor. In fact, radiation exposure is one of the only known risk factors for developing a brain tumor. Mahan is fighting a different beast this time. Five-year survival rates for children with ALL are reaching 80%. Five-year survival rates for glioblastoma, the most common and most aggressive malignant brain tumor, are around 10%. Glioblastomas are especially frustrating, often striking adults in the prime of their lives. They quickly spread within the confines of the skull, destroying normal brain cells. The tumors are heterogeneous, containing a mix of cell types, and are supported by a large system of blood vessels. And they can slip past barriers that oncologists have tried to put in their way, such as newer "targeted" therapies. As daunting as this sounds, progress is taking place. For a time, it was not even clear from clinical trials if chemotherapy lengthened survival times in glioblastoma. But the drug temozolomide appeared to make a difference. Since the Food and Drug Administration (FDA) approved temozolomide in 2005, the five-year survival rate has tripled. "We want to turn glioblastoma into a chronic disease, so that it's possible to keep it at bay for a decade, like with some other forms of cancer," says Jeffrey Olson, co-director of Winship Cancer Institute's brain tumor program. "So far, there have been incremental improvements in treatment, but no home runs." At the outset, a factor that sets the course for the rest of the patient's journey is how much of the tumor can be removed in surgery. But glioblastomas are especially tricky to remove cleanly—a task that has been compared to removing chewing gum tangled in hair. "Glioblastoma is the most challenging type of tumor we deal with," says Winship neurosurgeon Costas Hadjipanayis. "At the margin of the tumor, cancer cells infiltrate into normal tissue, and that region is very difficult to see during surgery." The cancerous cells often extend several centimeters into normal tissue, making removal of the entire tumor impossible. But surgery usually can alleviate symptoms, and if surgeons can remove 92% to 98% of the tumor, a patient's survival can be extended. 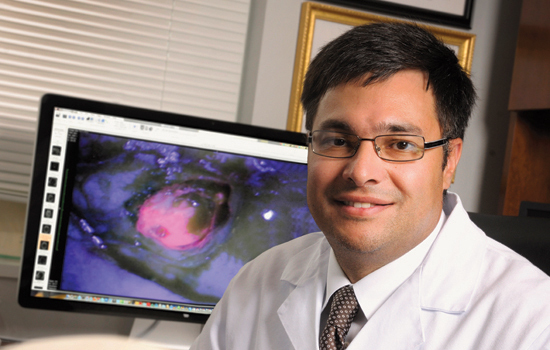 Led by Hadjipanayis, Emory has been testing an imaging agent that turns cancer cells pink during surgery, allowing neurosurgeons to discern tumor boundaries more effectively. Before surgery, the patient drinks a cocktail containing 5-aminolevulinic acid (5-ALA) to illuminate the cancer cells. Compared with healthy cells, cancer cells soak up more of this substance and then convert the 5-ALA into a chemical that shines pink when viewed through a special microscope. In Europe, surgeons using 5-ALA found that it helped them remove the brain tumor more completely, as determined by MRI brain scans, and prolong progression-free survival by several months. 5-ALA, which was approved for clinical use in Europe and is known commercially as Gliolan, is still undergoing evaluation by the FDA. Emory was the first medical center in the United States to use Gliolan and has been one of the top sites in surgeries performed using the imaging agent. Hadjipanayis has trained surgeons at other medical centers to use it as well. Winship Cancer Institute's Costas Hadjipanayis, Jeffrey Olson, Alfredo Voloschin, and Daniel Brat (above, left) are finding new ways to battle an old foe—glioblastoma. Radiologist Hyunsuk Shim (above, right) is using magnetic resonance spectroscopy to detect changes in cancer metabolism. 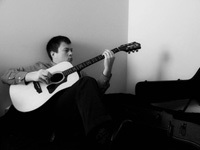 Photos by Jack Kearse. Gary Gelb, a pharmaceutical sales manager, lives in Atlanta with his wife and daughter. He was making a presentation to colleagues at a business meeting in Las Vegas in 2010 when he was distracted by a distasteful odor. Later that day, he found himself unable to speak. Both events were symptoms of a seizure caused by a tumor seen on CT scan when he was taken to a local hospital. The tumor was above his left ear in the temporal lobe, a region of the brain important for language. Gelb's case illustrates the tightrope neurosurgeons must walk in removing as much of the tumor as possible without compromising brain function. After his first surgery, Gelb impressed doctors and nurses with his ability to walk the hospital corridors, and he was able to go home in just two days. He continued working on his motor skills and balance by climbing stairs and taking walks, but the surgery had affected his short-term memory. "When I fell asleep, I felt like my mind was going through flash cards of words and pictures," he says. "Dr. Hadjipanayis said my brain was reconnecting the left and right sides." Concerned about possible side effects, Gelb declined treatment with temozolomide. Because his tumor was not a full-blown glioblastoma, he was able to exercise some discretion; studies show temozolomide does not give patients with less aggressive tumors a clear survival boost. "I was back at work and leading a team within 60 days," he says. Three years later, the tumor came back, and Gelb participated in the Gliolan study. Where Gliolan helped, Hadjipanayis says, was in differentiating tumor from brain tissue that had been irradiated and treated with chemotherapy. During part of Gelb's second surgery, he was awake, and Hadjpanayis asked him to identify pictures of animals on a laptop to test whether the surgery was interfering with the regions of the brain controlling language. After this surgery, Gelb opted for temozolomide, and he's also taking an anticonvulsant medication to avert seizures. Treatment strategies for some other types of cancer have been transformed by the discovery of "targeted therapies," directed specifically against the genetic mutations that drive tumor growth. But so far these strategies have been relatively unsuccessful with glioblastoma, Olson says. For example, about 40% of glioblastoma tumors have extra copies of the EGFR (epidermal growth factor receptor) gene, which provides a pedal-to-the-metal growth signal and is known to play a role in driving the growth of lung and colon cancers as well. But drugs targeted against EGFR that have extended patient survival in lung cancer have shown disappointing results with glioblastoma. "It comes from the germ-like nature of glioblastoma," Olson says. "It changes so quickly, like antibiotic-resistant bacteria. It isn't that the drug doesn't work or the science was bad, it's that the tumor becomes resistant." Similarly, clinical trials have shown no overall survival benefit for the drug bevacizumab (Avastin), which targets blood vessel growth, in newly diagnosed glioblastoma. While it has been shown to lengthen survival in other types of cancers, the efficacy of bevacizumab in glioblastoma remains a topic of debate among oncologists. Olson and the Winship brain tumor team have begun a clinical trial that combines the drugs bevacizumab, bortezomib, and temozolomide, with the rationale that glioblastoma cells will find resisting three drugs at once more difficult. And Hadjipanayis and his colleagues in the lab have been exploring the use of tiny iron oxide particles covered with an antibody that preferentially sticks to brain tumor cells. Injected before surgery, the particles would provide a prominent signal on MRI scans and could even be used to heat the tumor with magnetic fields, thus proving useful for both imaging and treating the tumor. Because of its lethality, glioblastoma was the first brain tumor to be analyzed by the Cancer Genome Atlas, an NCI-supported megaproject. Scientists cataloged genetic aberrations in 91 glioblastomas and then divided the cancer into four molecular subtypes. (Winship was one of the largest contributors of patient samples to the study.) Each subtype responds differently to aggressive treatment. "We are firmly in the era of brain tumor diagnosis that incorporates molecular genetic findings, sometimes at the level of the whole genome, for each patient sample," says Dan Brat, professor of pathology and laboratory medicine and director of Winship's cancer tissue facility. Already, glioblastoma tumors are routinely probed for whether the MGMT (methylguanine DNA methyltransferase) gene is active or silenced. Multicenter studies have shown that if a tumor's MGMT gene is active, the tumor is more resistant to temozolomide because it repairs DNA damage more quickly. But if it is silenced, the patient has a better chance of responding well to temozolomide. Winship researchers led by Erwin Van Meir and Hui Mao have developed a technique to use imaging to detect an "oncometabolite," a chemical produced by some brain tumors' warped metabolism that provides insight into a tumor's particular genetic mutation. "This is a significant advance, in that we can have a glimpse into the human brain without actually having to do brain surgery," Van Meir says. "The technique offers the possibility of following the patient after surgery to see if the treatment is working by monitoring the decline in levels of the oncometabolite." The sooner a doctor can get feedback on how a tumor is responding to chemotherapy and radiation treatment, the better. But this is trickier to determine than it might seem. Research by radiologist Hyunsuk Shim, a Georgia Research Alliance Distinguished Scholar, focuses on a perplexing problem in neuro-oncology: a CT or MRI scan does not always accurately depict what is happening. "I have a patient who seems to be doing great, but the MRIs come back every time and indicate that she has a possible progression," says Winship oncologist Will Read. Radiation treatment can cause inflammation that looks like tumor progression in scans. Also, oncologists suspect that treatments that target blood vessels, such as bevacizumab, can make the tumor appear smaller on brain scans, without much actual effect on the growth of the tumor itself. Shim has been examining the effect of temozolomide combined with an experimental drug, vorinostat. In tumor cells, genes that normally prevent runaway growth have been silenced. Vorinostat is thought to help reverse this silencing as well as making tumor cells more sensitive to the DNA damage provoked by temozolomide. She is testing whether magnetic resonance spectroscopy (MRS) can detect changes in cancer metabolism, which may indicate how fast the tumor is growing, shrinking, or dying. Her study, funded by a $4 million grant from the National Cancer Institute (NCI), uses MRS in an effort to detect whether vorinostat is having its desired effect after just two weeks. "Our hope is that this technique could be used to assess responses to other drugs besides vorinostat," Shim says. "It is better to figure out as early as possible which patients any given drug is working for." Allen Sowles, one of the first patients to have his tumor evaluated in this way, was attracted to Shim's imaging study because he wanted to take an aggressive stance. "I felt like I knew how the standard game played out, and I didn't want to go out without kicking," he said. The first sign of Sowles' tumor was numbness in his fingers, which he thought might be carpal tunnel syndrome. At the time, he was studying business at Georgia State while working as CFO of a business equipment firm. A couple of months later, Sowles began to have trouble spelling and doing calculations. He started to have focal seizures, in which the feeling of numbness would rush up his arm to his face. A probable tumor was located in his left parietal lobe, close to the brain region that controls the sense of touch. After his diagnosis was confirmed, Sowles travelled to Duke for surgery. He returned to Atlanta for radiation and chemotherapy, and met with Read, who told Sowles about Shim's study. "They never treated me like I was a terminal patient," he says. "That was really important to me psychologically." His response to vorinostat appeared strong, and after continuing treatment with temozolomide, Sowles returned to work, although not with the same punishing schedule as before. He was aware that every month was precious. In May 2013, he was able to greet his son's baby, Lucas. "I set a goal to be there for him," he said. "I became a grandfather because of the treatment I received." Sowles' tumor returned several months later, and he died at the end of December. Some glioblastoma patients live much longer than the average 15 months, although they are rare. Winship neuro-oncologist Alfredo Voloschin has a patient who was diagnosed at 35 and has survived more than ten years. "I don't pat myself on the back for keeping someone alive for a decade," Voloschin says. "There is no cookbook approach. Every patient is different."